Payette’s favorable platting provides a very functional city center with wide streets and uniform block sizes. 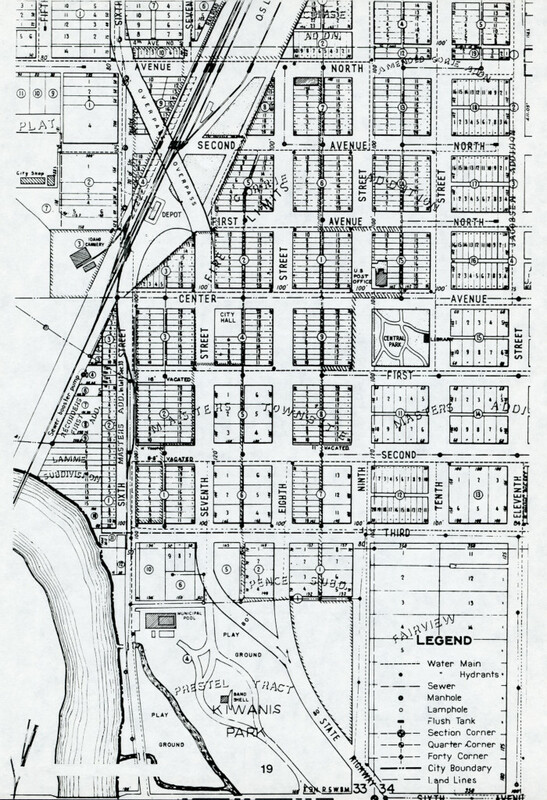 The original Masters Townsite Plat and Gorrie Addition follow a north-south block grid pattern with the blocks being 300 by 300 feet and the streets having 100-foot rights of way. Most of the blocks have twenty 30- by 145- foot lots. The alleys are narrow with a width of only ten feet. Second Avenue South is 120 feet wide. As illustrated in figures 6 and 8 the streets of the downtown had names like Tioge, Mill, Commercial, Main, Ada, Grand, Payette, Front, Broad, Boise, Park and Pence. These names were changed to numbered street names in 1911. Perhaps when the main commercial street (now 8th Street) was named Boise Street it gave too much presence to its competing neighboring city of Boise, which at that date was not much larger than Payette. Consideration should be given to renaming a number of the streets in the downtown such as 8th Street to Main Street. The city center’s utility network is in place representing a substantial investment for the community. Water, sewer, and power lines are typically located in the alleys. The city owns and operates its water and sewer facilities. Electric power is provided by the Idaho Power Company from its Western Division office located in Payette. Map 21 identifies the locations of utilities, streets, alleys and property lots.